“We wanted to look at the students that are often missed, students who are in what is known as the mental health service gap. They aren’t being identified and they aren’t receiving services,” Despina Petsagourakis explains. 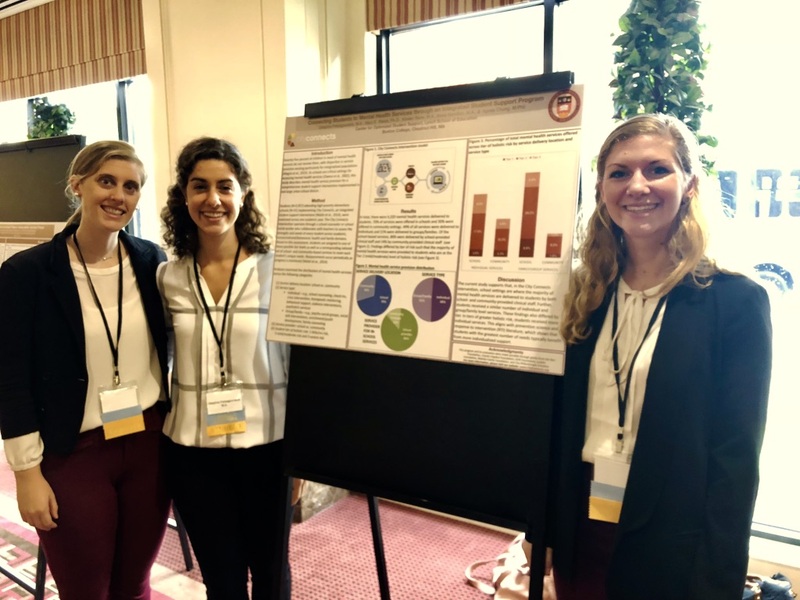 To do this, Petsagourakis, a graduate student at Boston College’s Lynch School of Education, and her fellow graduate students Kirsten Rene and Anna Hamilton, were part of a team that conducted research on 6,000 students in 15 high-poverty elementary schools in Springfield, Mass. To show the impact of City Connects, Petsagourakis, Rene, and Hamilton have essentially created a map of mental health service delivery in Springfield’s schools. They presented a poster of their findings last November at the annual meeting of the Massachusetts Psychological Association. In other words, City Connects helps schools see all of their students’ mental health needs. This enables schools to help students in acute distress and help children by detecting their needs at an earlier stage, such as when a teacher tells a coordinator about a student who is anxious, and the coordinator engages the family and connects the student to appropriate services that are preventive rather than reactive. Schools that follow the example of seeing each student holistically could then have staff members provide services such as running social skills groups, providing one-on-one counseling, or connecting students to community-based mental health providers. “Mental health is really only a snapshot of what City Connects focuses on. We could do the same poster for physical health or any other domain of development. City Connects’ holistic review allows coordinators to provide tailored and comprehensive services and supports in many areas.